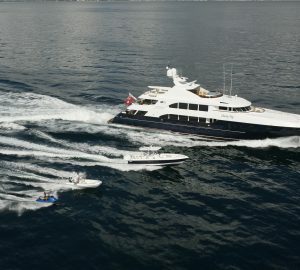 46m Motor yacht with accommodation for 12 guests, vast sundeck, state-of-the-art entertainment system. 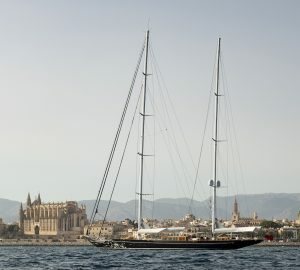 Avalon is 46m long and was built by Delta Marine in 2009. 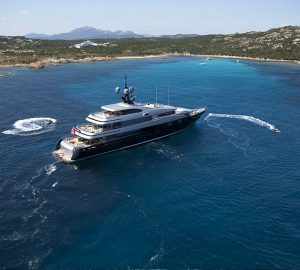 It’s a luxury superyacht which was designed by Jean Claude Canestrelli who cleverly incorporated glass, marble and wood into the vessel’s interior. She has state-of-the-art stabilisation systems which provide a smooth, comfortable ride when cruising at speeds of 12.5 knots, impressive. Richness and class exude from everywhere on Avalon. Cinamora burls, mahogany and dark figured Khaya veneers help to create an ambient atmosphere on board. Large windows and a curved glass entry with a mirrored set of bar cabinets provide a warm welcome. Admire the glass encased art displays as you enter the dining area with its custom-made mahogany dining table. 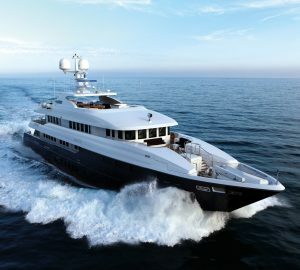 Elegant, timeless and stylish are just a few words that describe Avalon, a vessel that has been crafted to perfection. Families have been well catered for on board Avalon with lots of space, beautiful cabins, sunny decks and delicious cuisine. There’s sumptuous accommodation for ten to twelve guests. This includes four double cabins and a versatile fifth cabin which provides a double bed, single bed and a Pullman. These cabins all have private en suite facilities. The master suite forward of the main deck has amazing hull-side windows where you can look out to sea or watch the stars float by in the evening. Below deck are four good-sized cabins all decorated in satin finishes, soft upholstered wall panels and warm tones. The layout of Avalon has also been thoughtfully designed. The glass doors on the aft deck lead into a main entry. With flooring crafted in Breccia Oniciata marble and a Rosso Damasco border, it’s a beautiful to admire. The space then opens up into the main saloon. Here you’ll see cream Regency striped sofas and armchairs in burgundy plaid silk. The off-white soft carpeting and huge square windows finish the saloon off beautifully. A wide screen TV is set into a dividing wall that separates the dining area and lounge. The dining table is made from mahogany with matching counters in Breccia Vendome marble, quite exquisite to say the least! A hallway goes all the way to starboard. Here there’s a brushed stainless steel balustraded staircase with a curved handrail made from Khaya wood. This connects the lower and upper decks seamlessly. In a neat corner is a day head with a black granite counter top similar to the other bathrooms on board. Enormous windows and glossy woodwork give a sense of space while still maintaining Avalon’s timeless beauty. The forward section of the main deck has a full beam master suite again with intricate woodwork and huge windows. A large bed with white linen bedding faces aft so you can watch a widescreen TV any time you fancy. Sit your laptop on the port side desk so you can keep in touch with colleagues or family. Relax on the comfortable sofa to starboard and read your favourite novel, heaven. The large en suite bathroom has a his and hers sink, a gorgeous bath tub, a day head and a shower. A heated marble floor means no more cold toes in the morning while the white and red onyx details in the bathroom will certainly impress you. Here four guest cabins are decorated in beautiful colours with matching onyx en suites. Upholstered wall panels and delightful satin finishes create a soothing, elegant setting which in turn makes sure everyone has a space of their own. There’s also a cabin forward to port designed specifically for children. This cabin has a double bed, a single bed and a Pullman. It can accommodate a nanny comfortably. With its bath tub, iris mosaic mirrors and pink onyx finish, this really is such a beautiful cabin. The children’s state room is opposite another double cabin which has a honey and white onyx décor. Two other cabins to starboard and port are doubles with en suites, one is decorated in white and red onyx while the other is finished in green and red onyx. These cabins all have a his and hers sink. Moving up the stairs from the main deck will lead you to the upper deck foyer. The sky lounge is forward. As you pass a painting of Portofino you will see a green marble day head. This lovely sky lounge has three separate areas all decorated in rich cinamore burl and mahogany. It’s a more relaxed space than the main saloon, perfect for entertainment or having some time to yourself. Across the starboard side of the saloon is another lounge area. There’s a sumptuous tan leather sofa with two armchairs upholstered in blue stripes. The games table with armchairs provide another seating area. A curved bar with tall bar stools is situated in the forward starboard corner. The stools are in burgundy leather and have stainless steel bases. Have a drink here then go through the curved glass doors to the upper deck aft. On this deck is a custom-made teak dining table with ten chairs, just right for formal dinners or casual lunches. The deck has a shade provided by the overhang of the deck above. Look across the ocean waves to see dramatic views as you watch the world go by. Built in sofas in orange and pink stripes can be found on the main deck aft. Why not have lunch here? This is a great location to enjoy a drink or two and retreat to after a formal meal. The staircase to starboard on the main deck goes up two levels. 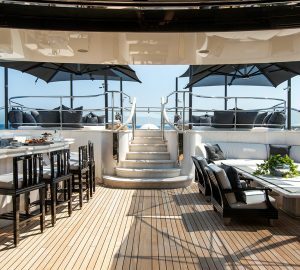 Pass the upper deck aft to the expansive open plan sun deck. 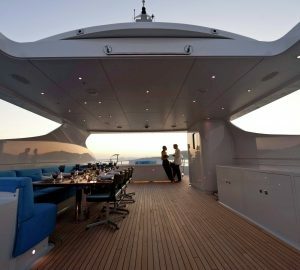 All of these decks are designed for charter guests to do what they came for, whether it’s relaxing or partying. 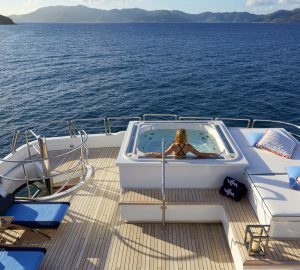 Why not take the plunge and unwind in the raised Jacuzzi on the sun deck? You won’t be blown away if there’s a wind due to the transparent protective screen surrounding it. There are built-in seats around the spa pool and free standing sun loungers ideal for soaking up the sun’s rays. Avalon has so much more including an additional circular bar with similar stools to those in the sky lounge. A carbon-fibre radar arch provides shade when the weather is very hot. There’s also moveable gym equipment as well as a day head here. On the Portuguese bow, discover a small, private seating area along with a hydraulic articulated trailer system for getting the main tender in and out of the garage. This trailer system is one of the latest examples in yacht charter technology and certainly an eye opener when Avalon was first launched. 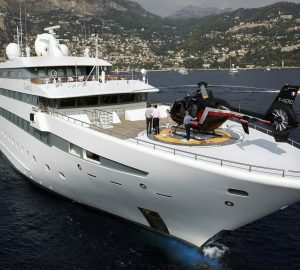 To sum up, Avalon can only be described as a warm, friendly and stunning luxury charter vessel. Her Delta Marine hull design and layout have been combined elegantly to show how classic styling and functionality can intertwine. The splendid stonework and wood on board are exceptional making this superyacht stylish yet cosy. Relax, enjoy and unwind on Avalon for a holiday of a lifetime.